Over the past year, we’ve tried really hard to be more conscious of the types of home products we use. 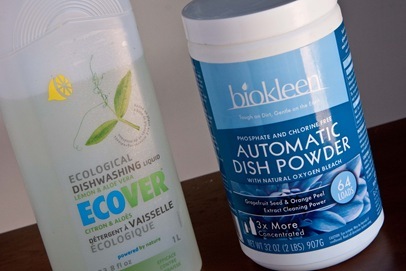 There can be a bit of a price jump, when using eco-friendly products, but there doesn’t have to be. There are many ways you can DIY a lot of typically bought products at home and/or search for coupons + store specials. I want to highlight some of the products we use + love and talk about a few DIY cleaners as well. I’m not saying this is the perfect solution, or the most environmentally friendly. However, it is much easier on the environment than typical store bought laundry detergents and saves a buck or two as well. I could go on. Here are links for more information, if you’re interested. Heather makes homemade detergent, which is where I got the idea last year. Thanks Heather! 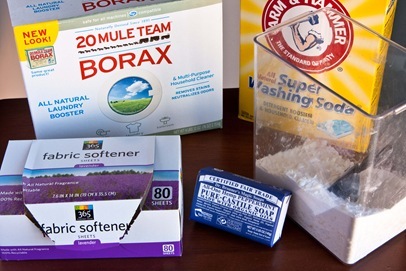 You can also make your own fabric softener at home, but I haven’t done that yet. I like these 365 sheets and I had a $1 off coupon for them. Before, I was using the Method dryer sheets, which each get 2 uses. I had a pretty big supply of the Method, but just ran out. They were on sale + there were coupons at Whole Foods back in the spring, so I stocked up. I actually love the “Method Baby – rice milk + mallow” scent the best! The 365 are recyclable and the Method are biodegradable. The “how to” for this can be found right here! I love both of these products!! We switch back and forth between dishwashing liquid, depending what’s on sale. Whole Foods typically has at least one on sale and there are often coupons. Stock up with you see both! This dishwashing powder has been my favorite yet! It has lasted us since the beginning of September!! We run a full size dishwasher about 3-4x per week. With this product, I haven’t had any problems with residue or powder left behind. 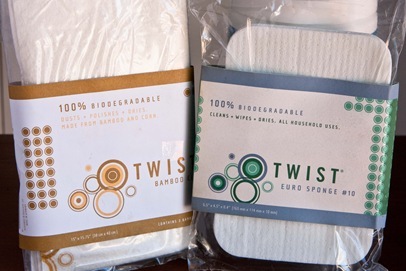 The Twist brand of cleaning supplies is awesome!! I’ve been using these for a few years now! I just love their sponges. They hold up and never seem to get a funky smell to them. You can also pop them in the dishwasher to clean and keep using. They seem to last longer than typical sponges and are frequently on sale. I always buy 3-4 when they are! I’m not sure if all, but most of their products are also 100% biodegradable. The product on the left is a bamboo cleaning towel. I’ve tried really hard to reduce the amount of paper towels we use and this is on eof the ways! A lot of companies also have coupons on their site, but if not you could always email and ask for one, saying you’re interested in trying out their product. You can recycle SO much in Ft. Collins and all of Colorado that it greatly reduces the amount of garbage we have. 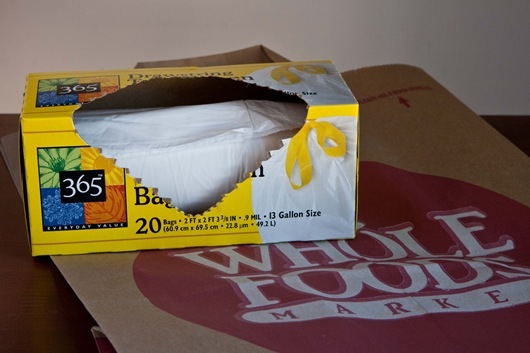 I use Whole Foods brown bags for recycling, because the bag can just get recycled along with everything else. Most of the time I use my reusable bags at the store, however sometimes I forget. :) I’ve been using these 365 brand tall garbage bags for awhile, and they work great [don’t fall apart easily]. They’re made up of 30% post-consumer recycled material. There are definitely more eco-friendly trash bags, but the price + quality of these work the best for us! As far as home cleaners go…I haven’t purchased one in almost a full year. I rid our house of bleach and all toxic cleaners last spring, and have been so happy + pleased since. No more insane headaches and light-headedness from cleaning the house! These super simple at home products work SO WELL. Also, they are extremely cheap! The most important ingredient is distilled white vinegar. 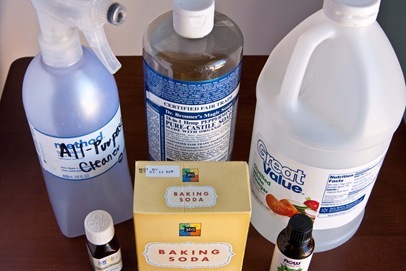 You can make a basic household cleaner with 1/2 water + 1/2 distilled white vinegar. I also add peppermint or orange essential oil for scent. At first, the vinegar is a bit strong, but I got used to it quickly. Adding in about 10-20 drops of oil, helps immensely. I reused old bottles from Method products I used before. I posted about these when I first made them, which you can reference here. I was even able to make a super easy glass cleaner! Add everything to the bottle and shake to mix. You have to make sure and wipe the surface until it’s completely dry, but if you do it leaves no streaks!! The cheapest place I’ve seen the Dr. Bronner’s liquid soap is Trader Joe’s. I got lucky and hit a sale at Whole Foods for this bottle. You only use a little bit at a time, so it lasts forever! Whole Foods also has their own brand of liquid castile soaps, that are cheaper. Both brands also come in other fragrances and have a multitude of uses! Add enough soap to make the mixture thick but spreadable with a wet sponge. Spoon some onto a wet sponge or dip sponge into the bowl. Spread around counters or sink. You might need to add a little more water to the sponge to help spread. Let sit for a minute or two and rinse off. This works fabulously and is a great alternative to products like Soft Scrub. The essential oil might set you back $5, but they range greatly in price. I picked up the orange because it was the cheapest at the time. They will last you quite a long time but are also completely optional. You don’t have to use them. I honestly have not bought a commercial cleaning product [except dish soap/detergent] for almost 1 full year. 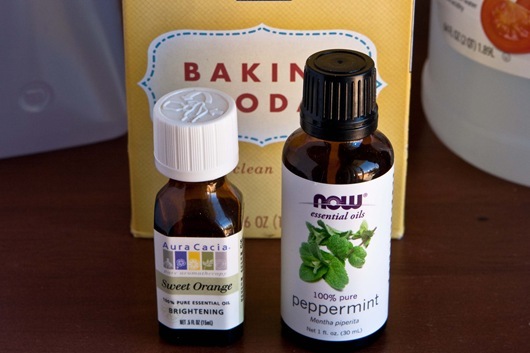 I love love love these DIY cleaners!! Yes, this is a how to on making your own deodorant. I’ve posted it before and am posting again, because I love it so much! Add more essential oil if wanted. Pour in an airtight container. Reuse a jar! *Do not store in an old deodorant container, like I said to do in my original post. :) It doesn’t work! Some links you might find interesting. 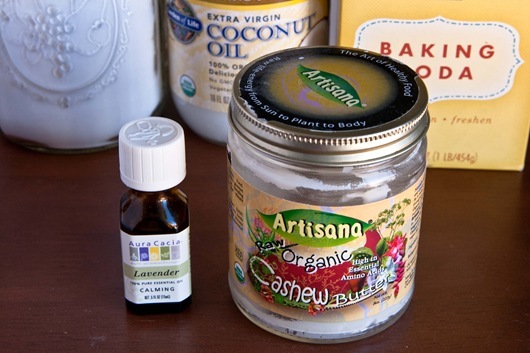 I’ve been using homemade deodorant for 1.5 years now and would never go back. I wasn’t a heavy sweater before, but always had that gross smell after a full day or working out, from the actual deodorant itself. I’ve tested this on multiple 2+ hour long bike rides in the summer and it works great! It took my pits about 2 weeks to get used to this new deodorant and adjust. The key is to rub it in well and get over the fact you’re applying deodorant with your fingers. :) I just love the lavendar coconut smell and haven’t heard any complaints from Chris! It also does not stain my clothing. 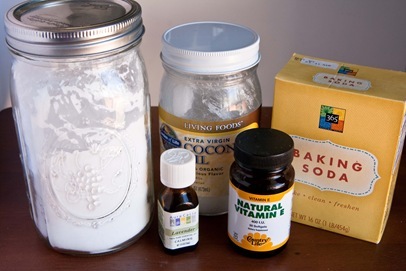 I have read that some people get mildly irritated skin from the baking soda. I had a period where this happened, but it didn’t bother me and has cleared up since. This has been the last area we’ve slowly improved in because it can be the most expensive. I just picked up the Jason’s hare care and am very pleased with it. The conditioner leaves my hair softer than it’s felt in years. The lavender shampoo was on clearance and Whole Foods has a $3 off coupon that I used on the apricot conditioner. The scents are mild and ingredient lists pass my standards. The bottles can also be recycled. The nature’s gate body wash has been one of my favorite natural body washes yet. Again, I had a $1 off coupon, making it compare reasonably to other non eco-friendly scrubs. The Alba lotion is a new product I just bought and is working really well along with dry-brushing. I got this with a $5 at WF. Gotta watch those deals! We got back and forth on which toothpastes we use, depending on sales. My favorite is Himalayan Herbal. It took a minute to get used to the strong flavor, but now we love it! I know there are easy ways to make toothpaste at home as well. Need to look into that! These are the main ingredients we avoid having in our toothpaste. There are many more that should also be avoided! You have to read natural toothpaste containers thoroughly. A lot still include the SLS + fluoride, etc. Here is a site, Skin Deep, where you can check the safety of your cosmetics/oral/hair products. I just checked the Jason’s shampoo and even this natural brand scores a 6/10. 1 is best. Crazy! You could go crazy checking, or just try to improve a little bit at a time, which is what worked for us! Again, I’m aware that these products can cost more money. However, on a tight budget with only one job, we’ve still been able to pull it off pretty well! Transitioning to DIY products has definitely helped. Also, check companies’ websites for coupons and WF has a great circular with coupons. Also check sites like mambo sprouts and natural food connection. 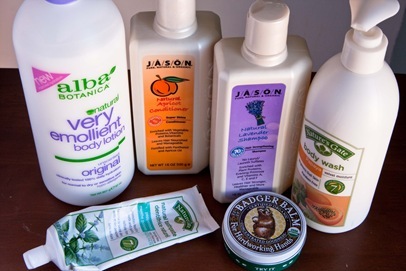 If there are Trader Joes in your area, check for great deals on soaps/shampoo/toothpaste there as well. With all of that being said, an exciting giveaway is coming up! I said it was going to be on this post, but I think it will be best to have it up first thing in the morning. I realized this post might get a lot of questions and comments and don’t want there to be excess confusion with a giveaway thrown in. Sorry for the change on that!! Tomorrow you can look forward to a yogadownload trial membership giveaway! !